Doctor Who Planet of the Giants DVD Review Can the Doctor and his companions make a makeshift bomb that goes off in Forester’s face and then start a fire to alert the police in a very unlikely way? Yes. Yes they can. 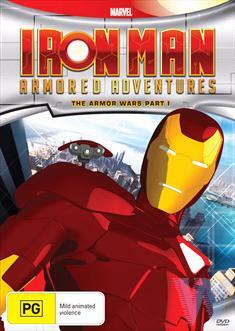 This is a super cool series that will appeal to both the kids and older geeks alike. Take the story of Iron Man from both the comics and the more recent movies, spin it around just enough to freshen it up for the new audience without alienating them and away you go. For those of you who are not familiar with how this works, basically in this series, Tony Stark is a teenage, with all the problems that entails, along with being Iron Man on top of all that. Backed up by his friends Pepper Potts and Rhodey, AKA War Machine, they fight the good fight against common enemies and of course super powered foes. This is a fun and fast series that simply had both the kids and myself hooked from the very first episode. I must confess if this was the first disc you are going to buy in the series then you might feel a bit lost. There is more than one reference to Stark's dad and a friend that has betrayed him that is never fully explained. The kids totally let that slip but I must confess as the family geek, that was bugging me during the viewing. The animation style is pretty awesome and looks great. The Iron Man suits look good and the younger Stark is cool as well. You can get a feel for the character and his moods, though if you are expecting lightness like in the movies, this Tony Stark has a lot of stuff weighing on him, making him a much more serious player than he will be as an adult. Episodes view well with a complete tale in almost every show, with an overall storyline running throughout to carry it all together. I like this; it's good to be able to watch one and not feel slighted but know there is more just waiting in the next episode should you want it. This was a hit with the whole family, and I would happily recommend it as a decent bit of fun that everyone will enjoy. Make sure you check it out upon release!